It’s more fun to ride a small bike on the limit than a brute at half throttle. That’s the theory, anyway—and it’s hard to argue when the small bike is this good. 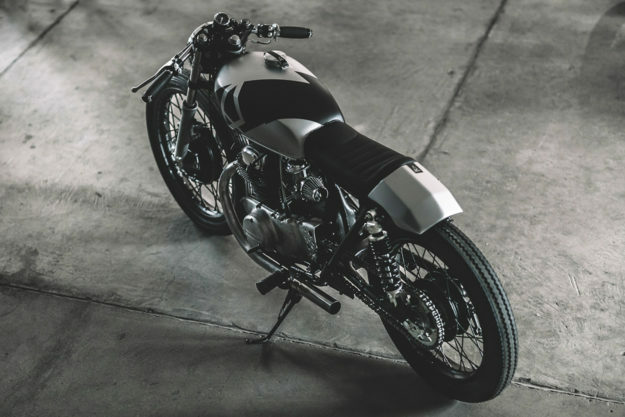 You’re looking at Hookie Co.’s latest release: a steezy Honda CB250 cafe racer with tight proportions. The young, Dresden-based crew of Nico, Cristoph and David can’t seem to put a foot wrong—and this nifty two-fifty’s got all the right Hookie elements. It’s their signature style that landed them this job in the first place. 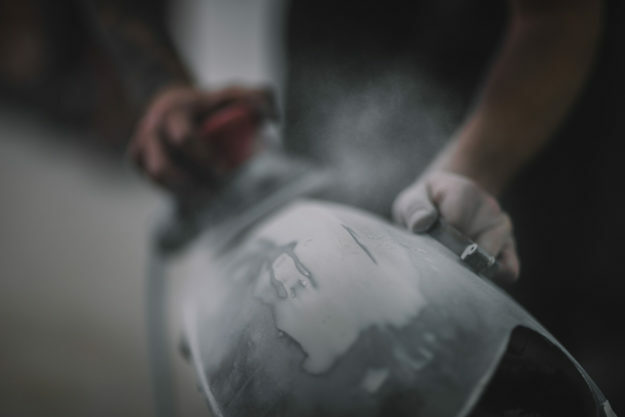 Their client is Markus Flossmann, founder of mountain bike manufacturer YT Industries, who reached out to Hookie Co. after spotting their work in a magazine. 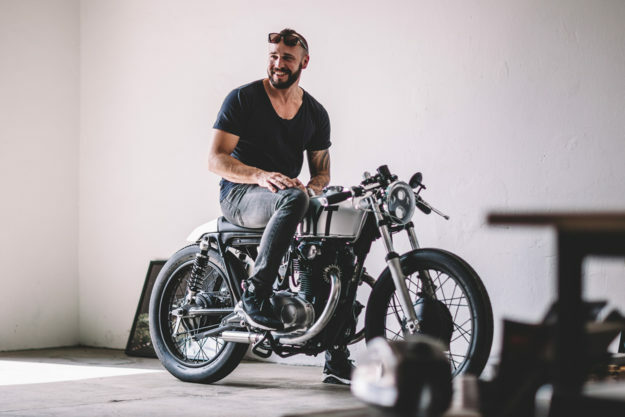 Since Markus wanted something compact, agile and not oversized, the guys recommended the CB250. With a suitable donor in hand, they set about slimming it down even more. Starting with a full teardown, Hookie cleaned up the frame, trimming it at the rear. 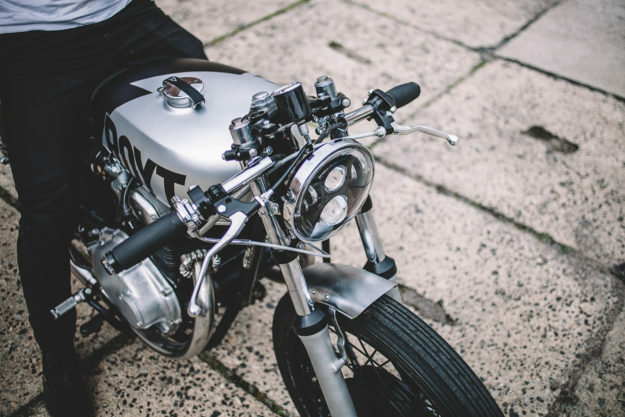 The stock CB250 tank is still in play, but the guys modded it to give it a more angular effect on top. 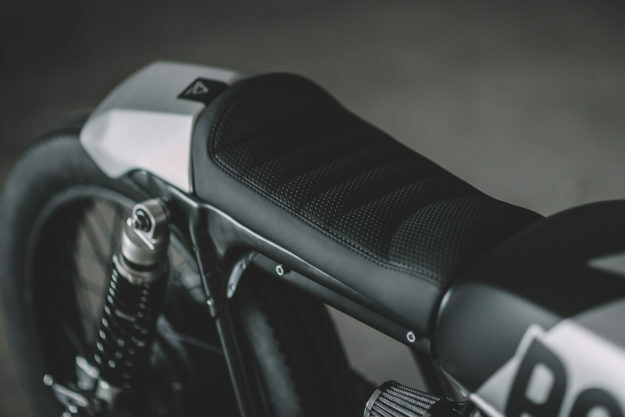 They then hand-shaped a new seat pan and angular tail bump, topping it off with a stylish perforated leather seat. To keep things sano, Hookie fabbed up a small electronics tray to go under the seat. Inside is a Motogadget m.unit and an Antigravity Lithium-ion battery. The rest of the wiring harness is all new—standard practice on every Hookie Co. build. The engine and carbs were also treated to a solid rebuild—and a healthy dose of bead blasting. 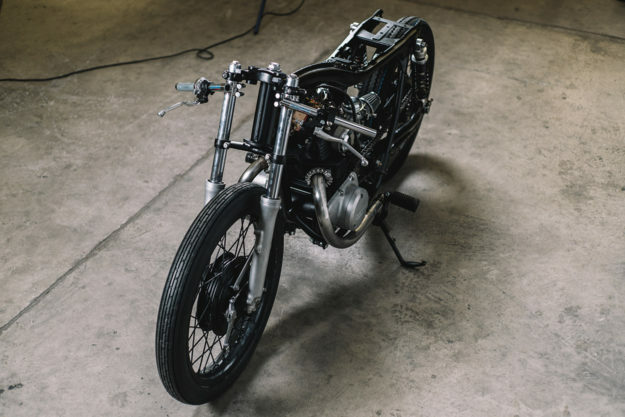 The carbs are hooked up to a pair of pod filters, with a custom stainless steel exhaust system handling the soundtrack. Hookie refurbished the front forks, dropped them using custom spacers, and added a set of progressive springs. There’s a pair of new YSS Eco-Line shocks out back, in a non-standard length. They opted to rebuild and keep the original drum brakes to retain some of the CB’s vintage charm. Tires are a 18” Firestone Champion Deluxe out back, and a 19” Avon Speedmaster MkII up front. 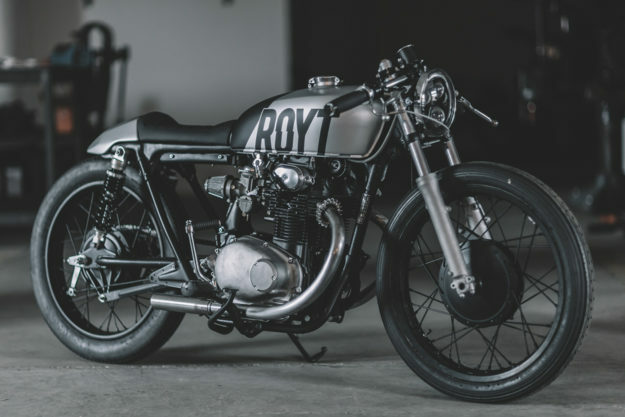 The final spec was completed with a JW Speaker LED headlight, a tiny (but legal) LED taillight, a simple speedo, clip-ons, Biltwell Inc. grips, and switches and bar-end turn signals from Motogadget. The guys included a front fender setup too, that Markus can attach if he ever has to put the bike through roadworthy. 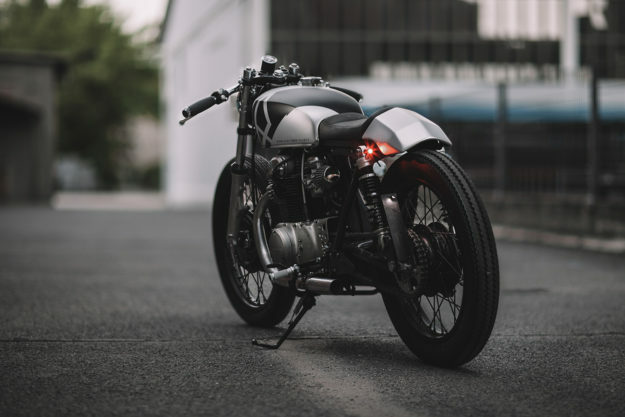 As for the CB’s final finishes, Hookie Co. kept things slick and monochrome. 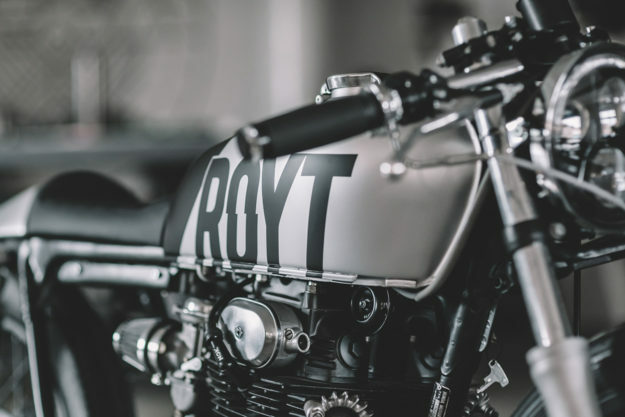 The wheels, frame and a selection of parts went off for flat black powder coating, and the tank and seat cowl went to the crew’s preferred paint guy, Adrian Flor. YT Industries drew up the design themselves; the abbreviation on the side stands for ‘Republic of Young Talents.’ And YT were so impressed with Adrian’s work, shortly afterwards he got the chance to paint the race frame of World Cup downhill racer and YT rider Aaron Gwin. 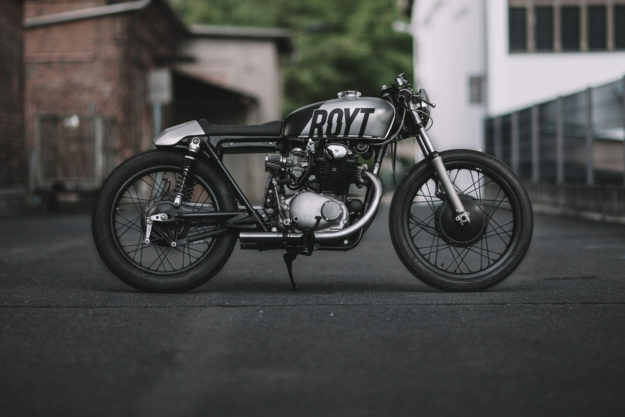 With its perfect proportions and all the right upgrades, this is one little bike we wouldn’t mind taking to the limit. Repeatedly.